HOW TO ORDER: Please enter the number of additional subscribers you are adding over and above the first one, in the box provided. Do not count the 1st subscriber when ordering. Bonus offer! Save 30% on any webinar purchase when you subscribe to Alabama Law Weekly today! Simply put both products in your cart and use coupon code LEGAL30 at checkout to get the discount. When Alabama attorneys need fast and accurate information on Alabama court opinions affecting their cases, they rely on Alabama Law Weekly. It's the one research tool that lets you constantly work faster, more efficiently, and with better information. Each week, Alabama Law Weekly delivers to you fast-read, definitive summaries of every Supreme Court and appellate court opinion, giving you fast, easy access to all decisions affecting your practice. Our expert legal staff distills the information for you, so you save time and avoid the risk of error or oversight. Alabama Law Weekly lets you instantly zero in on decisions pertinent to your cases. That's because ALW gives you not only summaries of all opinions, but also concise one-sentence "summaries within the summary" for the most significant cases in each issue. If this one-sentence summary does not affect your current caseload, you can quickly move on. With ALW you work faster, more confidently, and more efficiently. When the state legislature is in session, you receive summaries of all new legislative acts that might affect your practice. You also get summaries of selected opinions from the U.S. Supreme Court, the Eleventh Circuit Court of Appeals - both published and unpublished -- and state and federal trial courts. As a subscriber, you're eligible to receive ALW each week by e-mail, at no additional cost. We'll mail or fax you a copy of the complete opinion or legislative act you request for just 75 cents a page -- as quickly as you need it. You may e-mail your order to us at copies@mleesmith.com. You'll receive the only index that categorizes cases by subject matter, gives subsequent case history, and lists So2d cites. And coupled with AlaLaws.com, it gives you a powerful research tool to help you find Alabama cases for just pennies a day. The newsletter's quick summaries keep you abreast of cases as they come down each week. So what are you waiting for? Subscribe today! 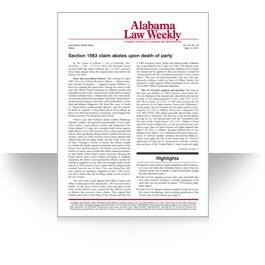 Almost as fast as court decisions are released, Alabama Law Weekly delivers to me concise, accurate, and easy-to-read summaries of each decision-decisions that may be important to cases I'm preparing to try tomorrow or next week. It's an excellent publication and I wholeheartedly recommend it." Hogan, Smith, & Alspaugh, P.C. "An absolutely outstanding tool . . . rapid, reliable, and affordable . . . an excellent service." Beasely, Wilson, Allen, Main & Crow, P.C. "ALW is a fast and reliable publication . . . [that] enables me to effectively serve my clients and is the efficient and cost-effective way to receive information. I wholeheartedly recommend ALW." Sadler, Sullivan, Sharp, Fishburn & Van Tassel, P.C. "First, it is extremely fast, sending out its concise, clear summaries within a week of the court's opinion. Second, it is very easy to use because the summaries are sensibly organized by both court and legal topic. It is a quality product." Richard F. Pate & Associates, P.C. "The best way I know for active trial lawyers to stay abreast of rapidly developing Alabama case law that can affect clients' files. Because of ALW, we've been able to eliminate other services and save library dollars." "Fast and reliable . . . one of the most useful resources available. I recommend it."